I used to come to Kingdom of Dumpling once a week for their delicious dumplings and lamb skewers. This hole-in-the-wall Chinese restaurant serves 20+ different kinds of hand-made dumplings, ranging from pork with napa cabbage to beef with carrots. 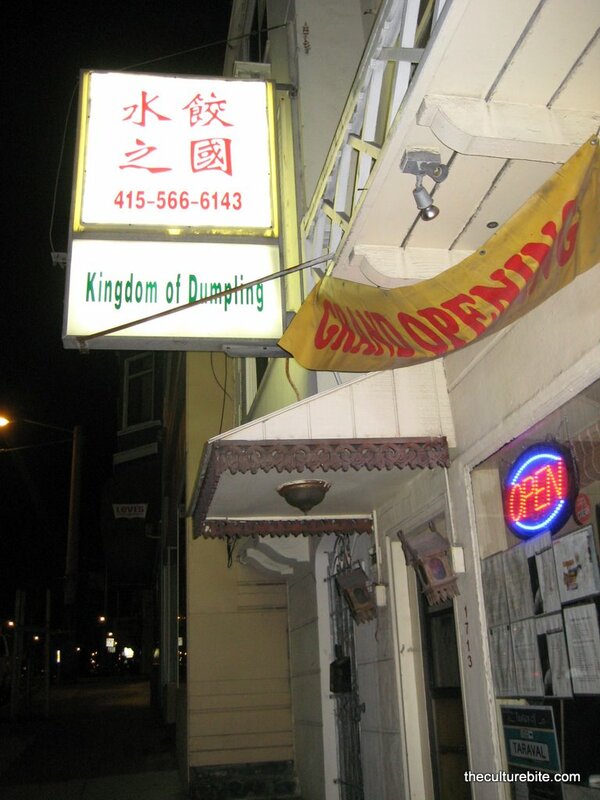 The main draw at Kingdom of Dumpling is their secret chili garlic sauce. I don’t know what the “secret” is, but it sure is tasty. The restaurant can literally only sit 20 people max and the line is usually out the door, so come here early to beat the rush. The one thing that’s been discouraging me from coming lately is the lack of cleanliness at the restaurant. Every time I do come, I’m always worried about something crawling up my leg. The food is undoubtedly delicious, but be prepared to send your dishes back 2-3 times to get clean ones. Pork and Napa Cabbage ($6.45)/ Lamb and Vegetable Dumplings ($6.95) (12 dumplings each) – These are the standard dumplings you can find at any dumpling restaurant. The dumplings are boiled then served, keeping the bite-sized goodies pure and healthy. The skin is thick and I’m pretty sure they add soup inside the dumplings to keep them juicy. Note: You can ask for these fried if you don’t want them boiled. Lamb Skewers (4 skewers – These are my favorite. I have to order this every time I come to Kingdom of Dumpling. The owner described these skewers as Shanghainese street food. The lamb, seasoned with cumin, hot sauce and other spices, is tender and juicy. Dip these babies in the hot sauce and you’re have a firey explosion in your mouth. Pan Fried Soup Dumpling (4 dumplings) – I prefer these to the (Xiao Long Bao) Shanghainese Soup Dumplings. The Pan Fried Soup Dumplings consists of the meat from the Xiao Long Bao and a bread-like skin. The bottom of the dumpling is fried until it’s lightly crisp. These are so bomb. The order comes with 4 dumplings, but the owner always gives us 5. XO Chow Fun – I’m a fan of XO sauce (dried shrimp/scallop hot sauce), so you can put it on anything and I’d like it. The Chow Fun can be oily at times, but it has a good spicy flavor. There’s tons of bean sprouts in this, so if you’re not a fan, make sure you ask for it without. Other items that are notable are the Crispy Beef Sandwiches, Won Ton Noodle Soups, and the Green Onion Pancakes. This is a bit unusual, but they also serve Rack of Lamb, Red Snapper and Creme Brulee. What really makes the dumplings sing is the housemade chili sauce. Everytime we come, I wish I could take home a container of the special spicy sauce. « Forget Hotels, Get A Villa!